More than 3,000 people in eight southern and eastern regions. 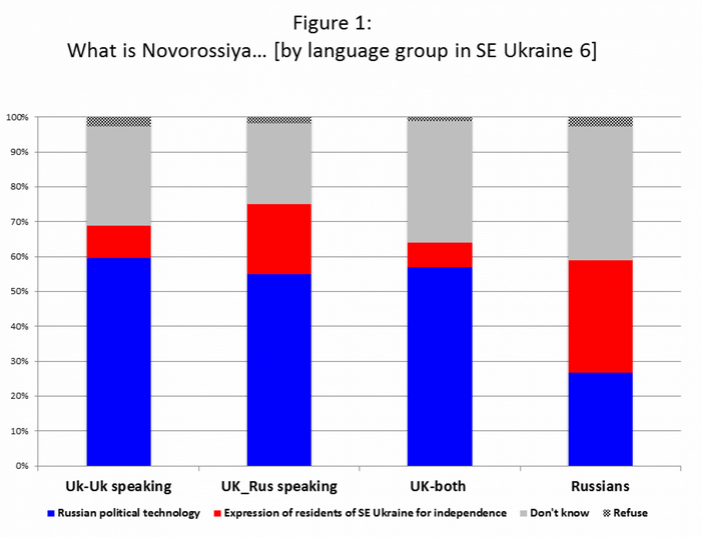 – Russian Speakers under pressure? – Support Russian sending Army to protect Russian-Speakers? This overwhelming majority opposed to Russian intervention extends to every region (97 percent, west; 94 percent, center; 69 percent, east; 75 percent, south), to all age groups (18-29 year olds, 85 percent; 30-49 year olds, 85 percent; 50 and older, 85 percent) and to men and women (men, 84 percent; women, 86 percent). In addition, 68 percent of Russian-speaking citizens oppose military intervention by Moscow. * Support for invasion dropped from 13% to 9% since last month. * 64% expect Russia to try to disrupt the elections. Integration with Russia into a single state is supported by 12% of respondents in Ukraine, and during recent years this number has decreased from 20% to 9%, but after Maidan – increased by 3%. The main part of supporters of this idea of unification with Russia is in the East (26%) and South (19%), while the smallest part is in the Center (5%) and West (1%) of Ukraine. By regions majority of integration with Russia in one state is in Crimea (41%), Donetsk district (33%), Lugansk district (24%), Odessa district (24%), Zaporizhzhya (17%) and Kharkiv (15%) districts, but even there support to the current status of relations with Russia – as two independent and friendly states – prevails. Do Ukrainians want Donbass to remain a part of Ukraine? – In the Donbas region 72.6% of those who took part in the study support the region staying part of Ukraine. – Odesa where 88.4% of the surveyed support Donbas remaining part of the eastern European country. The poll was conducted between the 4 and 19 of December in 179 villages and towns across Ukraine. The report states that 3,035 people took part in the survey. US Military Aid: A slight 52% majority of Ukrainians support this move, with three-quarters of respondents supportive in the west, and three-fifths supportive in the north. In the east, 62% opposed U.S. military support, and the south is evenly divided. The poll also found that Ukrainians were almost evenly divided (48% in favor and 42% against) on the use of force to regain territory lost to the separatists. Our comparative project funded by the U.S. National Science Foundation examines post-Maidan attitudes in Ukraine, as well as in Crimea now annexed to Russia, and in the Russian-supported de facto states of Abkhazia, South Ossetia and Transnistria. In December 2014, we organized simultaneous public opinion surveys in these regions and surveyed in 6 of the 8 oblasts of southeast Ukraine (hereafter SE6). We judged it impossible to do reliable survey work in war afflicted Donetsk and Luhansk, instead contracting with the Kiev International Institute of Sociology (KIIS) to administer a randomized face-to-face survey to 2003 persons in Odesa, Mykolaiv, Kherson, Zaporizhia, Dnipropetrovsk and Kharkiv. We asked a series of questions about Novorossiya.